It has taken me a few weeks to get around to writing this post, mainly because I really wanted to love this place and so I have been meaning to go back there since my first visit at the start of September. However holidays to Spain and general busyness have got in the way so I am just going to tell it how it was! Opening in late August Elliot’s Cafe at Borough Market received some great reviews in its first week and I was eager to see what the fuss was about. I am a big fan of Borough Market and the philosophy around this new establishment of sourcing fresh, seasonal produce from the market to create an ever-changing menu sat well with me. 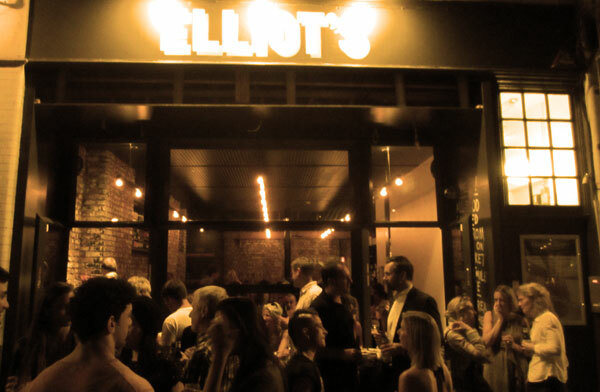 It was a balmy Friday night in London and by the time we got to Elliot’s it was after 9pm and it was heaving. Thinking we had no chance of being seated we asked Mr Front of House who said not a problem; 15-20min. Fantastic! Being such a warm night we didn’t mind and were fixed with a bottle of wine whilst we waited. And we waited. And we waited. The wait (ha that’s ironic) staff were run off their feet and trying to catch someone’s attention to find out the ETA of our table was near impossible. We finally made eye contact with Mr Front of House who seemed to have settled in for the night chatting with fellow diners, he was very apologetic and suggested we ordered some small plates which we could eat on the street, standing, but with the assistance of a rather small table we had acquired. By this stage it had been at least 40 min and we were starving. The tapas were simple but fresh and delicious. 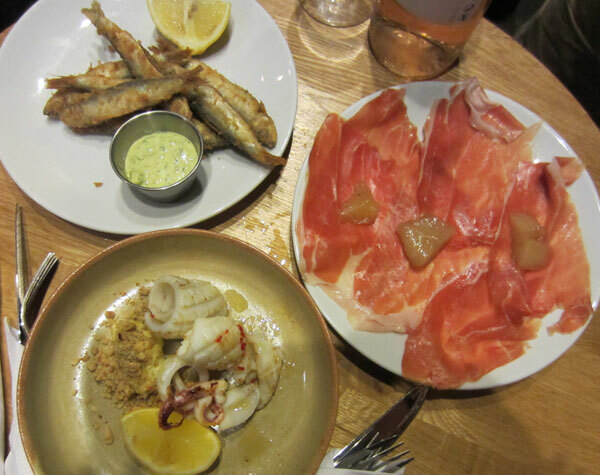 The squid, aioli and dukkah was especially good – loved the inclusion of the nutty spiced dukkah to a traditional pairing. Pickled peaches with the prosciutto was also a great combination, could have done with a couple more pieces of peach. 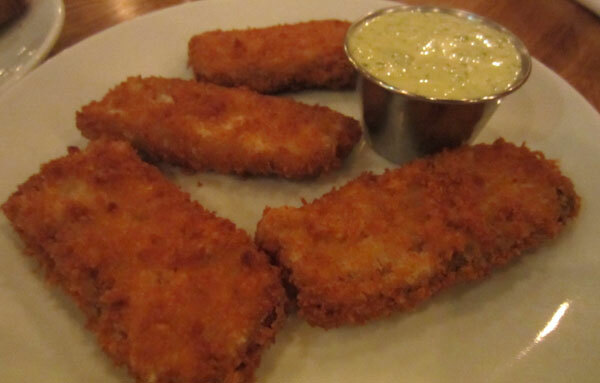 Fried sardines with tartare sauce were crisp and tasty. After the 40min wait it didn’t take us long to hoover these little dishes. And alas we were still waiting for our table. And had long ago polished off the bottle of wine! Over an hour since arriving we were finally seated inside and to be honest by this stage we were a little over it and I have to say the staff were too! But we were still hungry, so pressed on and ordered two more small plates and the game pie – which we had been eying off all night. 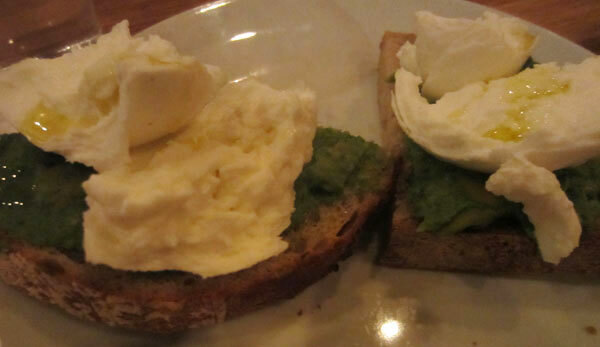 Creamy buffalo mozzarella on top a puree of courgettes and mint was delicious. Such a simple combination but the flavours and texture were spot on. Crumbed pigs cheeks were a new concept to me! And I thought I had tried everything! These were ok. Just reminded me of fish fingers and not something I would expect to eat at a restaurant. 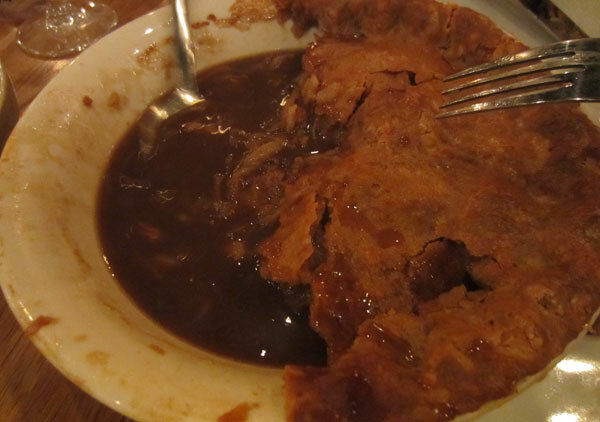 The game pie was quite a triumph. Although not to be taken lightly. It was incredibly rich and I could feel inches being added to my waist with just a whiff of the pastry. This is one pie for sharing and probably between four! We received very little attention from the staff once we were seated and even asking for the bill was quite an effort. Even more embarrassingly the poor waiter had to ask us what we had actually ordered as there seemed to be a problem with creating our bill. So we left Elliot’s with full and satisfied bellies but with an overall impression which didn’t match. I am putting it down to opening week teething issues and I will return soon as the food was good and the location great and I think Elliot’s definitely adds to the special offering which is Borough Market. I had lunch here last Tuesday, it was great. 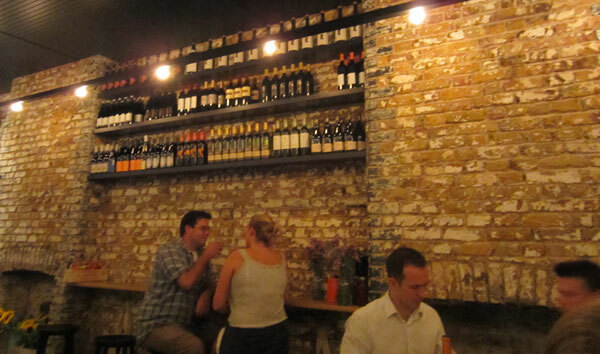 Food tasted fresh and delicious, along with a relaxed atmosphere and good service, I couldn’t give it any complaints. I’d definitely go back. The tapas you had sounds so tempting! I need to go back and try again, It had just opened when I went. I loved the set up and concept though.